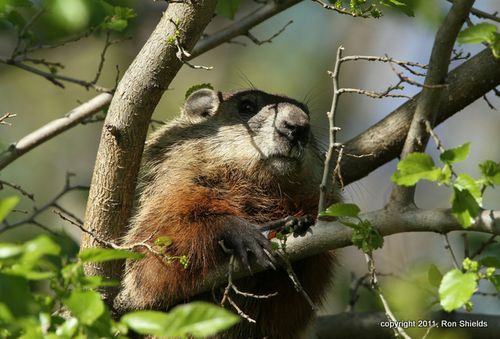 Do woodchucks have longish tails and do they climb trees? I saw something that looked like a woodchuck in a tree on Chubb Ave. eating berries. I didn't know they could climb trees. This young tree was slanting a bit and that may have helped it get up. When I stopped to get a better look it climbed down and ran away. LOL, Ron. I have seen them in trees over at Mill Creek Marsh, too, though I am not sure what this particular fellow was dining on. I was quite surprised the first time I saw one four feet up in a tree, also.